finding one of my most treasured albums has finally been reissued on cd instantly made my heart sing. worn vinyl and the hastily assembled cdr complete with singles tracks can now be left to various undusted corners thanks to this lovingly put together collection, of everything! to be honest i never thought this moment would arrive, such has been the continual blank looks of ‘never heard of them’ whenever i’d talked excitedy about these new wave futurists. of course, these eye-raising sighs go way back. as a shy fifteen year-old in 1980 living on a council estate on the edge of farm/factory-lands and london overspill rubbish tips exploring musical forms was my way out of mixing with beered-up louts and thug-life. luckily at a very early age my much older brothers would immerse me in the more alternative sounds of barrett-era floyd, stones and all manner of other good, bad and uglies, half of which i cannot even begin to remember. needless to say my ears were always open and by the time of teenage years music was really all i cared about. john peel continuously led me down kaleidoscopic roads but in the case of berlin blondes it was my brother’s mate ray (he frequented trendy new romantic clubs in the capital city) who left me a bunch of records to listen to one night whilst babysitting the nephew and nieces. amongst the kraftwerk and assorted electronic gems was the distinct and colourful, strikingly triumphant imagery of the berlin blondes lp. a sleeve to grace any future world, architectural and exquisite-human precisioned. once the needle drop-kicked into the opening cascading waveforms, swerving guitar, driving bass and machine percussion it already had me hooked. then steven bonomi’s vocals began to surface, wild and decidedly odd. they surely must be european? elements of roxy drama and metronome kinetics furthered this theory. 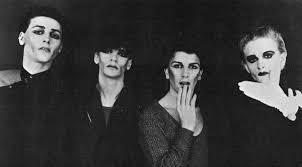 singular lines and phrases constantly embellished unlike their contemporaries of the time; tubeway army numan, mode or human league. motorik edges smoothed into fluid melodic curves and sweeping symphonics, gilded by the shimmering glow of bonomi’s hypnotic lilt. but this bold, magnetically joyous synth-laden pop was in fact born in scotland. in a way the exquisite designs of charles rennie mackintosh school of art could be found moulded into the sound of these glaswegians, a sense of them now clear. under the considerable skilful polish of mike thorne’s production fast-rushes of science and secret days sway effortlessly through the glamour of trail to istanbul and epic express of zero song. the whole album glides. and after thirty-eight years it still marvels and makes me incredibly happy. i once asked rusty egan why berlin blondes hadn’t been successful and he declared they never really had a song which could have hit, which is possibly true. their sound was commercial but perhaps a little off-centre for truly saleable success and the band wasn’t around long enough to go further. after the album and line-up change only one other single was recorded. whilst marseille is a beautifully constructed piece of angular, edgy grandeur on which the voice gloriously shines, without any major label push it proved to be their swan-song. another sigh from me. but, a lifetime of three seven-inch singles, one twelve-inch, an album plus a rare australian mix of science is all here, crisply remastered and barney ashton has also written great liner notes in the substantial, well-illustrated booklet. berlin blondes have lifted me on so many occasions and i’m so pleased the opportunity is now here for others to feel them. and boy, did they look great too! Uploaded by Hector Kiki on 2012-11-27.